﻿ Chicago Hispanic Newspaper, Lawndale News, Hispanic Bilingual Newspapers, Su Noticiero Bilingue » The Impending Wall? April 25, 2019 12:45 am You are here:Home Commentary The Impending Wall? 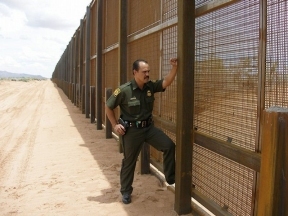 Posted by Editor on April 7, 2016 in Commentary | Comments Off on The Impending Wall? In a more detailed two page memo to the Washington Post, Republican presidential candidate Donald Trump revealed that as part of his plan to build a wall all along the U.S.-Mexico border, he will seize money transfers from Mexican nationals sending their money to their families in Mexico. Further, he stated that he will seize the assets of banks and companies doing business with Mexico as well, and levy higher visa fees on Mexican business personnel and Americans doing business in Mexico. All kinds of legal and moral issues are being challenged here. First, the President of the United States does not have the executive powers to seize money transfers from banks, wire and internet transfer companies, and individuals who might send money through the U.S. mail. Second, increasing visa fees and virtually fining Mexican business personnel and even American personnel doing business in Mexico would be considered a “hostile act” by Mexico and Mexico could retaliate. The result would be a trade war in which no one wins. Not only would such actions by a future “President” Donald Trump be a disaster for Mexico but it would also be a disaster for the United States and Canada. Since Mexico is the third largest trading partner with the United States after Canada and China, such a hostile act would totally disrupt the North American Free Trade Agreement. Such a rupture between the huge inter-trade network between the United States and Mexico would actually send more Mexicans fleeing towards the United States whether there is a border wall or not. Further, whole areas of Mexico that greatly rely on money transfers from Mexicans in the United States might actually become ever poorer and more unstable. Those families who receive these remittances now might become willing accomplices of the drug cartels if they no longer receive money transfers from their families in the United States. The result could mean far more powerful drug cartels than is true now, and even unrest and war in Mexico. Just as equally alarming is that the President of the United States would be granted broad powers unheard of in American history to control the U.S. economy and therefore the entire country. If Trump were to be granted these types of powers, then the U.S. Congress and the judiciary would be little more than rubber-stamp institutions and the U.S. Constitution itself would be in great peril. In short, Trump would become a dictator with no boundaries of where his control ends and begins. We can only hope for three things; first, that there never will be a Trump presidency, second that a border wall between the United States and Mexico is ever built, and finally that no one person in American history will ever have total power over our lives that might occur if they are able to trash the U.S. Constitution.